Joan Jiko Halifax (born July 30, 1942) is an American Zen Buddhist teacher, anthropologist, ecologist, civil rights activist, hospice caregiver, and the author of several books on Buddhism and spirituality. She currently serves as abbot and guiding teacher of Upaya Zen Center in Santa Fe, New Mexico, a Zen Peacemaker community which she founded in 1990. Halifax-roshi has received Dharma transmission from both Bernard Glassman and Thich Nhat Hanh, and previously studied under the Korean master Seung Sahn. 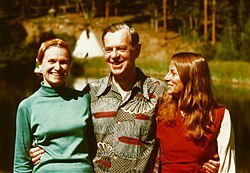 In the 1970s she collaborated on LSD research projects with her ex-husband Stanislav Grof, in addition to other collaborative efforts with Joseph Campbell and Alan Lomax. She is founder of the Ojai Foundation in California, which she led from 1979 to 1989. As a socially engaged Buddhist, Halifax has done extensive work with the dying through her Project on Being with Dying (which she founded). She is on the board of directors of the Mind and Life Institute, a non-profit organization dedicated in exploring the relationship of science and Buddhism. 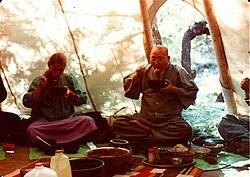 Joan with Seung Sahn Soen Sa Nim at the Ojai Foundation in 1979. Joan Halifax was born in Hanover, New Hampshire in 1942. At age four a serious virus caused her to go legally blind, from which she recovered two years later. In 1964 she graduated from Harriet Sophie Newcomb College at Tulane University in New Orleans, Louisiana, where she had become drawn into the American civil rights movement and participated in anti-war protests. Halifax moved to New York City and began working with Alan Lomax, and by 1965 she was reading books on Buddhism and teaching herself how to meditate. She worked at the Bureau of Applied Social Research at Columbia University with Alan Lomax from 1964–1968. She then went to Paris and worked at the Museum of Man in the Ethnographic Film Section. She received her Ph.D. in medical anthropology and psychology and worked at the University of Miami School of Medicine. She also went to Mali, where she studied the indigenous Dogon tribe. During the 1970s, Halifax went to Mexico to study the Huichols. Halifax entered a relatively short-lived marriage with Stanislav Grof in 1972. While together the two examined the use of LSD as a support mechanism for those dying, jointly publishing the book The Human Encounter With Death in 1977. The book discusses several "rebirth" incidents which are rather similar to regular reports of near death experiences. In 1979, Halifax founded the Ojai Foundation, an educational and interfaith center. In 1990 Halifax founded Upaya Zen Center located in Santa Fe, New Mexico. The center offers Zen training, in addition to various courses and retreats on topics such as engaged Buddhism and caring for the dying. According to author Sarah Buie, Upaya is, "...a residential and teaching center on the outskirts of Santa Fe on the site of earlier Buddhist communities. While proceeding in an organic and incremental way, integrating existing structures into the Upaya campus, Joan's vision for its present form has been comprehensive. It is based on her deep understanding of the consonance of mind and spatial expressions. She considers our condition of interrelatedness and interdependence (ties to ancestors and traditional uses of the land, natural cycles and resources, placing sites within the local topography of mountain and river, the interdependence of exterior and interior spaces, and relationships with the community itself) in the design choices she has made. Caring stewardship of the land and its resources has been a constant factor in the development of the site. As has already been noted, Joan Halifax has done extensive work with the dying over her career. Professor Christopher S. Queen writes—in the book Westward Dharma (edited by Charles S. Prebish and Martin Baumann), "She teaches the techniques of 'being with death and dying' to a class of terminally ill patients, doctors, nurses, lovers, family, and friends. She speaks calmly, with authority. In a culture where death is an enemy to be ignored, denied, and hidden away, Joan physically touches the dying. She holds them, listens to them, comforts them, calms them, and eases their suffering by any means possible. She shares their thoughts and fears; she feels their last shuddering breaths, holding them in her arms. She travels easily from church to synagogue, hospice to hospital, dispensing techniques and training born of Buddhist traditions and beliefs in a culturally and spiritually flexible manner." In March 2011, she was appointed a distinguished visiting scholar at the John W. Kluge Center, Library of Congress. Halifax, Joan (1998). A Buddhist Life in America: Simplicity in the Complex. Paulist Press. ISBN 0-8091-3785-2. Halifax, Joan (1993). The Fruitful Darkness: Reconnecting With the Body of the Earth. HarperSanFrancisco. ISBN 0-06-250369-3. Halifax, Joan (1991). Shamanic Voices: A Survey of Visionary Narratives. Arkana. ISBN 0-14-019348-0. Halifax, Joan (1982). Shaman, the Wounded Healer. Crossroad. ISBN 0-8245-0066-0. Grof, Stanislav; Halifax, Joan (1977). The Human Encounter with Death. E.P. Dutton. ISBN 0-525-12975-8. Halifax, Joan (1968). Trance in Native American Churches. OCLC 26412971. Halifax, Joan (1997). Being With Dying. Sounds True. ISBN 1-56455-493-7. Halifax, Joan (1987). Thorns and Roses Living Mindfully. New Dimensions Foundation. OCLC 16185539. Omega Institute for Holistic Studies (1992). Elder As Healer With Joan Halifax. Panacea Productions. OCLC 28118179. ↑ "Joan Halifax Named Distinguished Visiting Scholar at Kluge Center". Library of Congress. March 11, 2011. "Alive in Death (Issue 24)". Dharma Life. Winter 2004. Retrieved 2008-03-02. Findly, Ellison Banks (2000). Women's Buddhism, Buddhism's Women: Tradition, Revision, Renewal. Wisdom Publications. ISBN 0-86171-165-3. Leach, Nicky; Richard Mahler (2005). Insider's Guide to Santa Fe. Globe Pequot. ISBN 0-7627-3690-9. Prebish, Charles S.; Baumann, Martin (2002). Westward Dharma: Buddhism Beyond Asia. University of California Press. ISBN 0-520-22625-9. Skog, Susan (1995). Embracing Our Essence: Spiritual Conversations With Prominent Women. Health Communications. ISBN 1-55874-359-6. Zaleski, Carol (1987). Otherworld Journeys: Accounts of Near-Death Experience in Medieval and. Oxford University Press. ISBN 0-19-505665-5. Joan Halifax at TEDLua error in Module:EditAtWikidata at line 36: attempt to index field 'wikibase' (a nil value). This article includes content from Joan Halifax on Wikipedia (view authors). License under CC BY-SA 3.0.